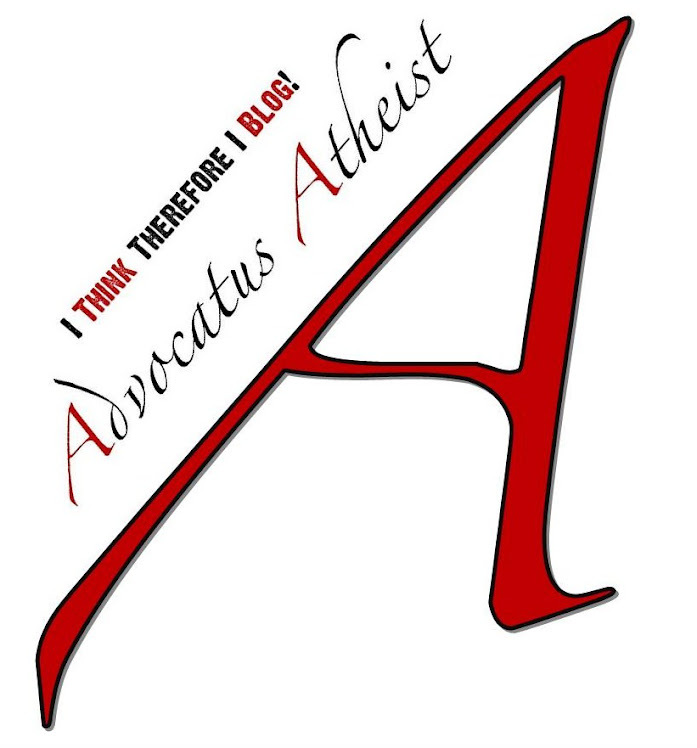 Advocatus Atheist: Is the Bible the Best Supported Ancient Text Ever? 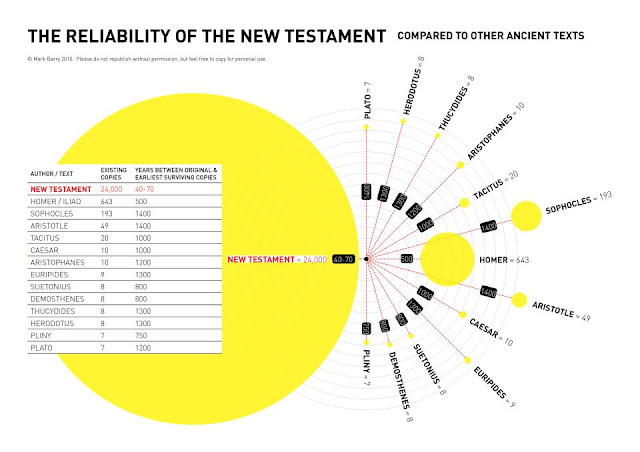 Is the Bible the Best Supported Ancient Text Ever? A Christian friend of mine posted this image on FB. I like the design of the chart, but the information is completely irrelevant to the point being made. In other words, it in no way lends credence to the claim of reliability. You cannot take different counts of various ancient texts and then say one is more reliable because of a near ubiquitous proliferation of surviving texts from antiquity. The survival of a text does not relate to whether the histiography used to understand that text is adequately suited for doing so. This "best supported ancient text" argument is an apologetics ploy which neglects to fully consider the fact that reliability has nothing to do with the proliferation or survival of popular texts. 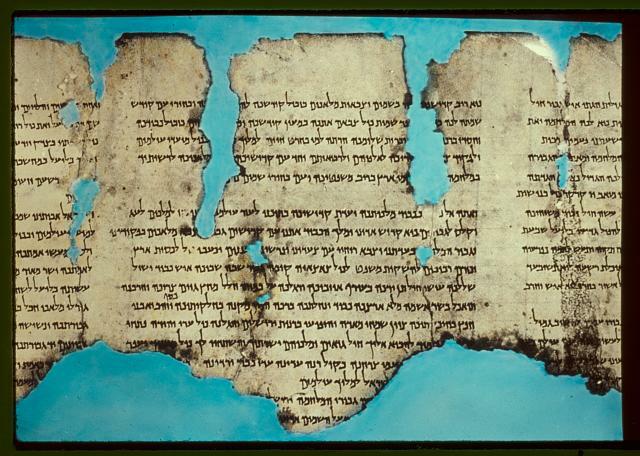 In fact, the more ancient the text is the less likely there would be means of preserving it. Especially in the case of the Homeric epics which are separated by nearly 500 years of history--in a time when the stories weren't even written down (Fagles, 1997). Oral tradition preserved the stories long enough for them to eventually get collected and written down. 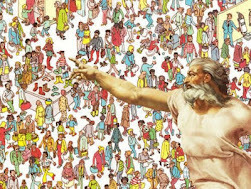 In fact, that makes the survival of the Iliad, Odyssey, and works like the Epic of Gilgamesh that much MORE miraculous than any surviving fragment of the NT! The NT comes out of the Greek Hellenistic period when there were entire sects devoted to copying down the texts, the Essenes for example was one such group (Feather, 2005). But the very fact that the NT texts were written by aristocrats is perhaps a better explanation for their proliferation (Talbert, 1986). Those who funded the production of the texts could *afford to make copies. They had the money, the materials, and the means (Carrier, 2009). It's why you get things like the Synoptic problem in the first place--there were just so many competing variations of the same story. When the Gospel writers wrote their version of the Gospels they were relying on other source texts, which have since all been lost to us. Interestingly enough, the discrepancies in their copying/storytelling reveals a lost tradition of borrowing from other sources. "Best supported" then is simply a false dichotomy. It does nothing to support the argument of reliability (Ehrman, 2010)--but somehow manages to neglect to consider all the available answers as to why the Gospels did survive antiquity in the first place (Ehrman, 2011). Also, I should add, it neglects to account for the texts that didn't survive antiquity due to regrettable happenstance, like the fires that burned nearly all of Aristotle's work. A tragic loss in the course of human history. If *all of Aristotle's works had survived, there is no telling how much more his influence over Christian tradition might have been. 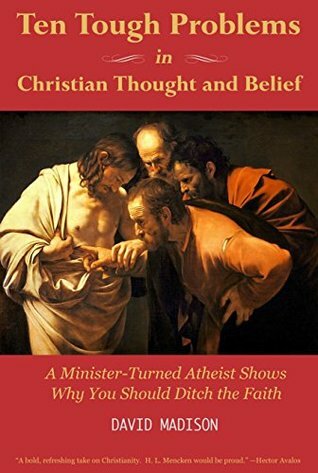 His few surviving works certainly helped to shape Christian thought over the course of history (Armstrong, 2008). Undeniably so. This is just another observation, which in no way relates to the reliability of ancient documents, other than to say, they seem to become somewhat less reliable when you factor into account the amount of influence ancient documents have had on each other (Loessl and Watt, 2011). 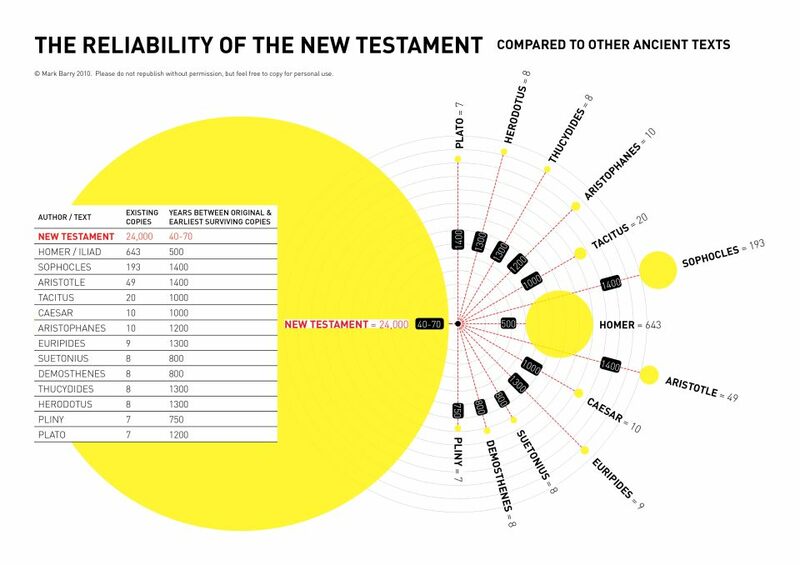 That is to say, how much of today's Christian thinking was shaped by the Bible and how much was shaped by those great thinkers, which this chart attempts to diminish, like Homer and Aristotle? Needless to say, it is this very cross-cultural-influence which explains for why we find traces of the Homeric style of writing tucked within the Gospels and the book of Acts (MacDonald, 2003). A style which was not traditionally used in the recording of ancient histories, such as those by the Jewish historian Josephus, but which was frequently utilized in the production of historical fictions (Helms, 1989). Another interesting example of cross-cultural-influence. Actually, according to the ever useful Wikipedia, there are actually more than 24,000 surviving fragments. Just reading through the numbers they give I tallied over 25,000 fragments. But then we are told that there are more than 400,000 variations of these fragments! That doesn’t seem reliable to me. That seems to be the opposite. Many more of the fragments are, in point of fact, too fragmentary to actually use for dating or further analysis. Again, not very reliable. Reliability depends on two factors. Accuracy of a text to the actual historic events or, similarly, accuracy to extemporaneousness accounts of the same event. The more unison *differing texts are on a matter, then a consensus can be formed. But when the *same accounts differ, and there are discrepancies between the histiographies, then this makes a text less reliable or else not reliable at all. Because of the astounding number of surviving biblical texts, historians have been able to count the discrepancies between these texts. There are more than 400,000 differences between them. That makes for a picture of unreliability, because the accounts vary--not only in content, but also in structure, verb usage, pronoun selection, and often times message. All of this needs to be taken into account of the number provided, because it contradicts the point I think you are trying to make. Also, the 95% only accounts for similarity of the texts. It actually doesn't account for the larger percentage of divergence, because some texts with be more or less similar to each other than other ones. For example, you will have ABA, ABB, ABC, ACC, BCC, AAA, BBB, CCC, AAB type patterns. You are claiming they are 95% similar. Which is true. But they are all different from each other. CCC for example is farther from ABB then ABC. The C's overlap, making ABC more similar to CCC. But ABC is more similar to ABA because it has two overlaps. Which is why the 400,000 plus differences actually goes against the point you are making. Additionally, we are only working from copies of copies of copies. We have no original surviving first editions. So we cannot say how much divergences, or drift, from the original documents there may have been. To point out that 95% of the copies of copies of copies are similar to each other doesn't mean they were divinely inspired. It means the copiers were likely working from the same, or similar, source material. That said, there should be absolutely NO divergence if the copiers were competent and all the originals were the same. But because there ARE differences, we must assume the scribes frequently made errors, which they did, or that the originals might have been divergent as well. It might only be a matter of 1st edition vs. 2nd edition publications, but the greater the initial discrepancy the greater the drift is over a longer period of time. All these elements seem to suggest a very mundane progression of a popular text in a time when copying was becoming a cultural establishment. To argue you can't trust the works of Homer or Plato because there is less copies doesn't mean their discrepancies are greater. Aristotle's work, for example, are almost universally the same due to the limited surviving texts. Meaning it has an accuracy rate of far higher than the 95% without the additional discrepancies to consider, just to point out one example. Anyway, I hope that clarifies where historians are coming from and why apologetics like this leap to conclusions before considering all the information.